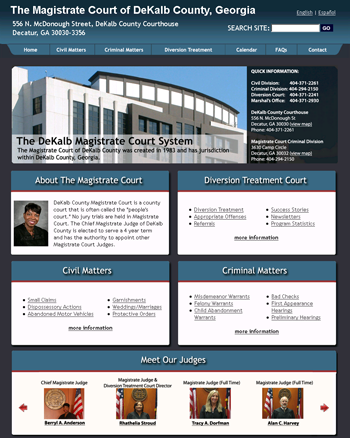 The DeKalb County Magistrate Court wanted a new bi-lingual website that would engage their visitors and make it easier to find information related to their courts and their services. WebXperts spent a lot of time working with the Magistrate Court Judges and County Clerks to determine the best way to display the information they wanted shown. A tremendous amount of effort was placed into creating just the right mix of a content-rich website with a modern look and feel that other Magistrate Court websites currently had not implemented. The Civil and Criminal sections were divided to make the information more clear, and a special area was created for the Diversion Treatment Court of DeKalb County, which is the longest running mental health court of its kind in Georgia. A detailed FAQ section was also created, so that the general public can easily find answers to their questions related to the DeKalb County Magistrate Court. A customized site search was created, so that users can easily search the entire site in only seconds. Not only is the site geared for search engine optimization, but it is also 508 compliant which means it is accessible to handicapped web users.